Greetings! I'm back! I've been occupied finishing up The Spires & Steeples of Wilmington, North Carolina, a new 30" X 40" pastel. My time has been devoted to finishing this project and required one more visit this week for finishing touches. I've been attracted to the architecture of Wilmington for some time and decided last year to proceed on this project. I've visited each building numerous times and photographed them in various conditions. This assembly --this composition has much to offer, I think, in the way of architectural integrity and aesthetic design. Combining the steeples of so many buildings is a perspective nightmare, one I believe I solved or worked through by planning around the symmetry of the larger buildings and the balanced array of smaller towers, plus the inclusion of two beautiful fountains and two ancient trees from downtown and north near the new bypass (this live oak off 17 North was spared, thankfully, and deserves a spot for perseverance if nothing else -PERSEVERE, by the way, is the adopted theme of Wilmington, as seen on the seal of the city). There are a few other churches I considered, but frankly, I can't do them all, and I selected these classic spires & steeples for their unique contribution to the skyline of Wilmington. You won't find any pre-fab fiberglass units here, in fact, some of the stone on the older churches has had to be repaired and now the churches have a slightly different look due to basically sealing the stone in a durable colored paint concoction. When I started this project, First Presbyterian was looking old and dirty and previous repair patches were showing, especially when the building was damp. Now, the church is almost concluded, the revealed tower looks like new, except now the fragile stone is hidden under a warm almost peach flavored beige paint --an expensive but necessary step and I'm glad I have the new First Presbyterian look in this painting. 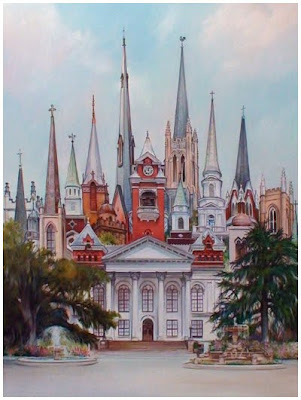 The Spires & Steeples of Wilmington is a large pastel that will be available in Wilmington as well as offered as giclée reproductions in scaled sizes on canvas and paper. Fidler's Gallery and Framing in the Cotton Exchange in Downtown Wilmington will be handling the original and giclées. More to come about this with details and videos in the next days, plus I hope to get back painting something else. A commitment like this leaves me primed for some outdoor work and variety --some natural architecture like flowers and clouds! Often when riding through the country I will stop to stretch my legs and visit favorite trees, vistas, and farm animals that attract my eye. This little goat was such a friendly guy, he walked right up to the fence and stuck his head through the wire. I scratched his head and admired his fresh face and what looked to be a smile. I think many of us respond to creatures that convey emotion or what we human beings interpret as such. Our wonderful Golden Retriever named Guinness has the most expressive eyebrows. You can read all sorts of things into his expressions, No one can tell me I'm imagining something when I detect that my dog is irritated with me whenever I'm leaving him in the house or that he's looking purely delighted after his bath and towel rub-down. Click below for a video from VIMEO, a Flash presentation. 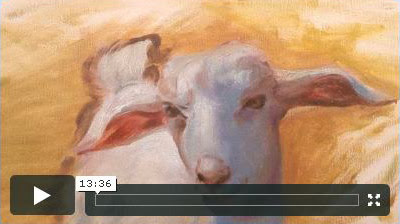 This Happy Fellow video is a partially accelerated oil painting session made earlier this year (speeding up after about 4 minutes) -a quick oil portrait of a friendly little goat. As I mentioned, I met this sweet fellow a few years ago on my passage through the country on my way home from church in Bentonville, NC. I always wanted to paint this image from the photo I was fortunate to have taken, and decided I would do so while recording the entire process. This video is about 13.5 minutes long, and has no audio since it just sounds like a lot of scratching anyway. I realize now that I hold my breath and sigh a lot while painting --quite revealing! --like I have paint apnea! Maybe other painters will be interested in observing some of the technique and method. It was very good for me to witness myself objectively and plan for my next paintings and any future videos which will definitely be shorter, narrated, and produced in a different manner. This is an oil painting made on canvas that was previously toned and prepared with paint mixed only with linseed oil for a dried, smooth, primed colored and defined ground. 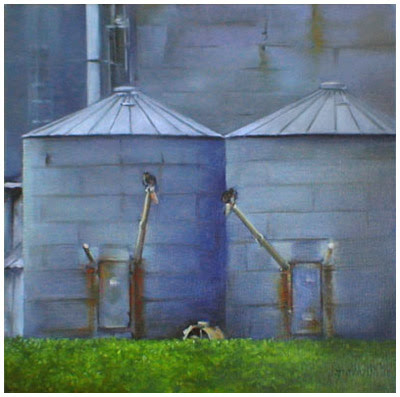 I prefer an oil primed linen or thick canvas that is not too absorbent. When using a cotton and gessoed canvas I will completely cover the canvas by scrubbing in and laying in large zones of color. I'll create an under painting of a buttery paint mix that when dry will accept new paint on top without absorbing it through or below. It is a technique easily accomplished and makes for such a pleasant painting experience. I think few amateur artists ever have this pleasure, for painting on canvas duck as most do is sort of like painting on a piece of carpet. 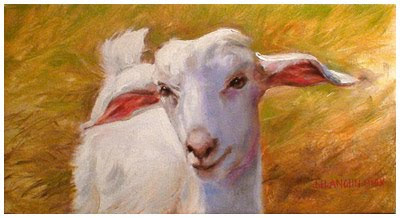 Even those who work with acrylics would benefit from priming their canvas with paint and acrylic gloss medium to tone and begin to define their work. After it is dry, working on top of a glazed oil or acrylic is a dream! It is like working on glass and painting becomes more like sculpture than coloring. Too bad this is rarely taught or expressed! If it was demonstrated more people would probably stick with painting since it would be a hell of a lot more fun and produce much more acceptable results. Happy Fellow is sold and in the possession of a happy young couple. I hope I will get to paint all their kids someday! 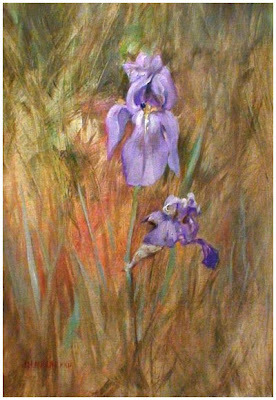 Painted in my front studio from life last Spring, this pale purple iris was from our yard, I believe. I love these flowers and go out of my way on my walks with the dog to visit them as they bloom around the neighborhood. Our house has two honey bee hives up high in the front columns, so I feel a bit more connected to the neighborhood blossoms. One of the things I love about iris is the way they curl and shrink as parts die down and new flowers come on. The co-mingling of new and old, the living and the dead, both on one green tubular stem is something to note. I wish they would last longer, but fortunately, where I live, there is almost always something beautiful to observe and appreciate. And at least I do notice these temporal gifts, even if I don't always get it on paper or canvas. I will try today to step into some new painting project, but I am so close to finishing my Wilmington pastel --I may just devote all my time at the easel to that. I'll post it here as soon as I have it signed and can scan it. Hope Plantation in Windsor, NC is the restored home of former NC Governor David Stone. 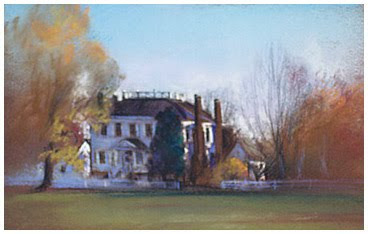 The mansion in this pastel was built in 1803. The holidays are a great time to visit Hope Plantation as the buildings are wonderfully decorated with natural materials such as holly, beeswax, and all sorts of native plants. A few years ago, my wife and I joined part of the decorating team to learn a few things -my wife, Antoinette, working alongside Betsy Overton. I made my way outside and painted this pastel before the sun was completely set. For those who have never painted in this way I recommend you try it very soon. As an artist invests in a subject and observes it over a brief span of time, it is truly amazing what one sees as the light shifts and fades, comes and goes over different areas --things you would normally miss in the quick movement we generally make in our lives. Working fast helps an artist, and being able to remember what one sees is a great asset as a subject such as this old house and trees will slide into a completely alternate look in just about no time. This is a scene on the Rouse Farm, just out of Snow Hill on Highway 13. 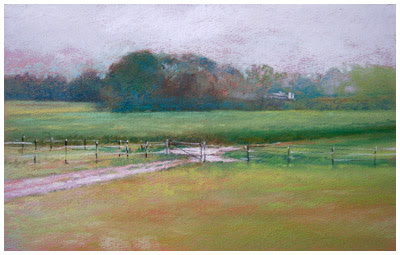 A plein air pastel. One of several made that day. The Steamer Neuse operated from New Bern to Washington, NC in the days before public ferry systems, bridges, and decent roadways. Having sailed much of the Neuse River I can appreciate how long it must have taken and what some of those trips would have felt like as the river is very wide and can fetch up some nice sized swells. While a pain for frequent travelers it must have been an exciting trip for the infrequent passengers and children. For those of us living in the 21st century (and you know there are some who are not), a steamer trip like this would have been much too long and dull. But what a great little journey for reading or snoozing, or just watching the shore line and sky. 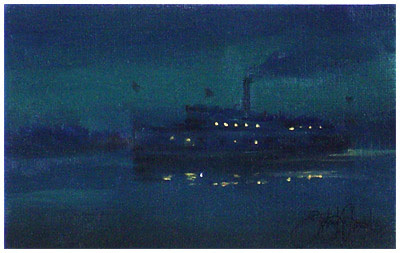 I like to imagine how ships appeared at night. I'm posting older works as I'm in the middle of a 30 X 40 inch illustration of the Steeples and Spires of Wilmington, NC. I should have that finished in a few days and will have time to apply myself to more daily painting, which is something I'm longing to do and have been wanting to do for some time. Years ago I served a church in the country near the Bentonville Battlefied. Just north of the Museum and Battleground were these silos --they are gone now. Fortunately I photographed them just weeks before they were torn down. I always saw the shapes of giraffes from the rusty doors and the pipes and motors. When I pointed them out to my kids or other people they said, "Oh yeah!" The oil original is no longer available but reproductions on canvas will be coming soon. I believe they are about 24" square. I'm always attracted to paths and roads. The path tugs for our movement and exploration. Old wooden barns get a lot of attention, but new structures, even plastic sheathed barns like these might get some notice --especially against interesting skies. 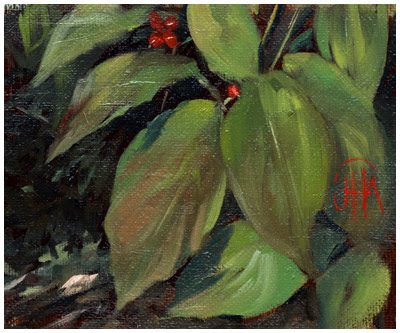 This oil painting is small 5"X 7", with my JHA monogram, not dated (circa 2007), matted with a single white mat at 12"X 14". This lovely blossom greeted me a year and half ago at the NCSU Arboretum in Raleigh. Not much was in blossom but Magnolia Biondi, an early blooming (-10°F, USDA Zones 6-8) welcome sight. 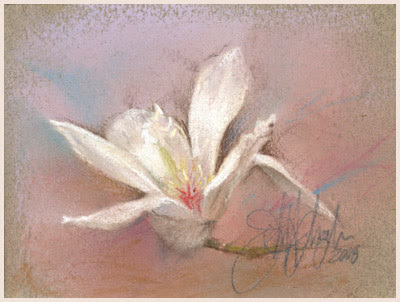 This is a sweet small pastel on paper (100% cotton), image size about 3 x 4 inches, with a simple white single mat measuring 8 X 10 outside dimensions, I gently wrote in pencil on the mat just below the opening, "the Hope of Spring Magnolia / Magnola Biondi". Unframed. Signed John H. Anglin 2008 in pencil. I'll miss it. My yard is changing fast --the leaves fading quickly! These dogwood leaves are now either red or on the ground. 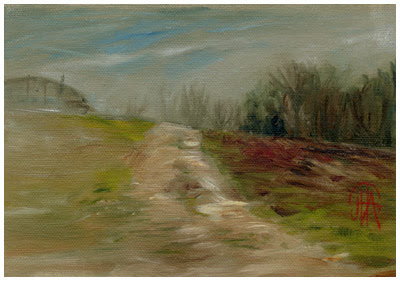 I painted them live last week, standing in the backyard of Sarahurst, the house we live it at Kinston. I don't remember a more beautiful year for our dogwoods --in the spring it seemed the blossoms were around for almost a month and remained nice looking shapes and great color for week after week. Now, at the end of the year they are continuing to show well with lots of red berries and great leaves. Against the blue sky the sight is arresting, as you probably know and can appreciate if you've been watching your own yard and neighborhoods for the changing colors. 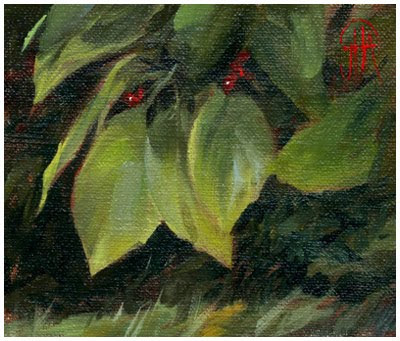 Actually, it was the poison ivy leaves that I should have painted --they were a dark cadmium red and now, after a little rain, are all gone. Next year! I'll try to capture these dogwoods once more before they are all gone. These are both oil on linen, painted late October 2009 from life. The painting at the top is 5.25 wide X 5.75 high, and the one above is 5.75 wide x 5 high. Both are monogrammed JHA --no date visible. Will be sold as a set via Ebay Auctions. Inspired by my time with the ADA MAE, a 1914 North Carolina skipjack, restored and in use with Carolina Coastal Classrooms out of New Bern, I made this little oil painting. 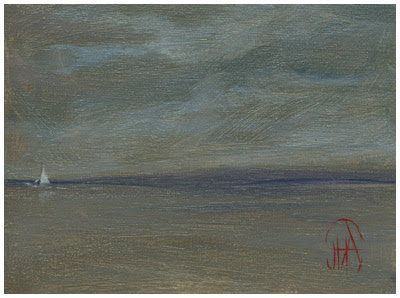 You can see my pastel of the Ada Mae on the skipjack page of the CCC website. Carolina Coastal Classrooms is a great project which I'm proud to be a small part of with website and graphic design assistance. We've made a few videos at YouTube, but now with HD our plan is to make great strides with video in the coming year (we'll resolve the sound issues, too). Ada Mae will get pulled soon for repairs, including work on varnishing the mast and boom. She needs it! Come spring she'll be looking smart and then we'll make new videos, and probably a few new paintings, too. Just northwest of Snow Hill this old structure always grabs my attention as I'm passing by on my way to Wilson and Raleigh on HWY 58 North. The beautiful silvery reflective metal is enough of a treat, but of course, the face formed by the symmetry of the windows and door is quite arresting. Usually I catch a glimpse as I'm moving by at 55 MPH in the daytime. 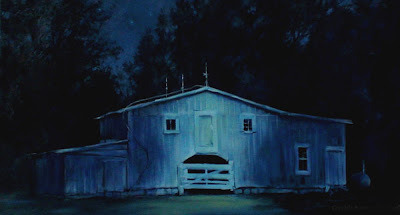 One evening I stopped and actually got out of the car to observe the barn in partial moonlight. Here is a Google Map Link: 35.50067 -77.738197 -check out the street view. Finding faces in common objects is something many people do --from seeing faces or shapes in clouds to noticing faces in simple things like faucets or the electrical wall outlet that looks something like the silent scream. Any painting I've ever done with rocks or stone has evoked the same kind of public analysis and provided entertainment to find the faces. The stark face on the old pack house barn is pretty hard to miss. I think it evokes a robot face similar to something I had as a Halloween mask and costume 45 years ago. Of course, I've taken my liberties with this subject, but it is still a fair representation and I think a lovely nocturne of the building. This photo doesn't do it complete justice as the painting only looks this bright with full daylight or a bright lamp upon it. I currently have it hanging in a dark corner with subtle light from a nearby door softly illuminating the central part of the painting. Some things are best left as dark and dimly lit subjects. Passing by the painting, on the way to the kitchen, has almost the same effect as driving by the real McCoy. Nocturnal Visitor is a 16 X 30 inch oil painting on canvas. It is framed with a dark distressed frame that suits the painting nicely. Contact me if interested.